North Kitsap’s popular Grub Hut restaurant just rolled into Bremerton. The Kingston eatery began stationing a food truck near Fourth and Pacific earlier this month. The mobile “Grub Hutr” will be parked in the area each Tuesday. 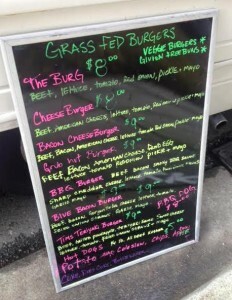 The Grub Hutr offers several grass-fed burger varieties, along with hot dogs and sides. There’s no fryer on board, so the menu is slimmer than what you’d find in the restaurant. 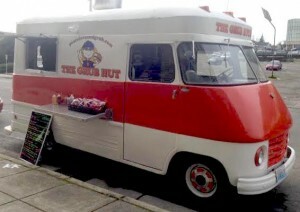 The Grub Hut’s truck joins a very modest fleet of Bremerton-area food trucks. An Island Tiki Truck can usually be found by Uptown Mercantile. The Taqueria Los Cazadores‘ mobile kitchen is frequently stationed on Sixth Street. Grub Hut owners say they would consider keeping the truck in Bremerton more days each week if near the shipyard are strong. The Grub Hutr arrived in town as Poulsbo’s Liberty Bay Books announced plans to keep its Pacific Avenue pop-up store into the New Year. Could this be the beginning of a trend of North Kitsap businesses venturing into Bremerton? As a Poulsbo resident, I’m all for it. For updates on the Grub Hut food truck, see the restaurant’s Facebook page.